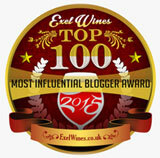 DISCLAIMER: Wine-Blog is a journal of my PR wine activities and learnings. 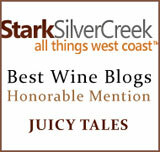 1) I occasionally write stories about wine clients, but don’t charge them for that time. 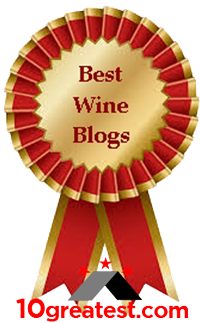 2) All wine reviews originate from free samples, sent by PR people representing the brands. 3) Images are mostly mine, some are purchased, a few rare ones are part of fair trade usage. Since November 1994, the Ultimate Thanksgiving issue from Bon Appétit holds the most delicious recipes ever. And each year, I run right back to this well worn issue, to continue the journey. In fact, this magazine is the only one that has survived any other magazines over the years. 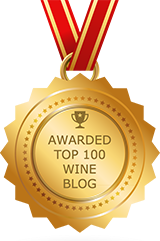 For this blog posting, I decided to taste wines and then think about which recipe would pair well with some of those favorite wines. 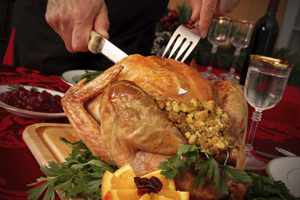 I’ve also decided to just stick with the bird and its stuffing recipes. When you see something you like from a recipe title, just Google the title and similar recipes will pop up. If you’d like a twist on your Traditional Thanksgiving, these recommendations will definitely take you on a delicious adventure, because just the titles of the recipes are going to pique some interest, I’m betting. This is a spectacular wine, beautiful garnet in color from a New World Pinot, a nose filled with aromas of Old World Pinot, a touch of cedar on the finish, and a perfect match with anything Shiitake… The flavors of this wine are adoringly delicious. Here I am tasting it at 7:45 a.m.; tasting it and thinking, “is it time for a glass?” (I’d better slip back into my earlier coffee mode, or I’ll be a goner for the rest of today’s work, just reveling in this Pinot. FROM THEIR WEB: “This second vintage is made of 11 year old clone 115 vines sourced from the Eola Springs Vineyard just outside Salem, Oregon in the Eola-Amity Hills AVA of the Willamette Valley.” The alcohol is 13.4 percent. This is a very food friendly Pinot. With only 125 cases produced, this is also a very rare and special Pinot Noir. 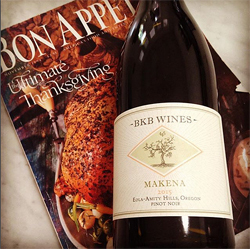 Here is their very sweet story: “Our wine symbolizes the first of many memories and the first of many to come with Makena, our first vintage, drawing its name from the beach where we were married.” This is a wine that perfectly fits Thanksgiving for people who love food and great wines. 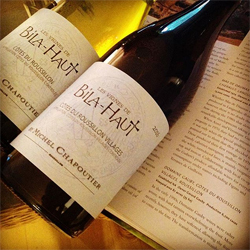 Bila-Haut is one of my favorite samples to taste and enjoy. At a food-friendly 13.5 percent alcohol, it blends really well with many foods, like the recommended Roast Turkey with Maple Herb Butter. It also is a perfect wine for appetizers, so opening it pre-huge meal, is also recommended. The nose is always inviting, the swirling and sipping is so easy to enjoy. The savoring comes when you swirl it and then taste it in a lingering way… Swirl it around your palate and the flavors burst into early autumn fruit, like apples and pears, as well as mid autumn fruit, like lemon and persimmons lingering. If you see a bottle of Bila-Haut at your wine shop or grocery store, I’m betting that your sales person will tell you that there’s a lot of wine for the money in this wine brand. Don’t hesitate to give it a try. Unless the bottle is off (it can happen to any wine), you’re in for a delicious treat, as always with this one. 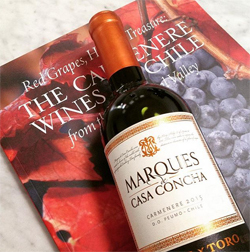 2015 Marques de Casa Concha Carmenérè from Chile. Okay, this is a turkey recipe with spicy flavors, so we’re going big, with the Carmenérè grape. The Marques de Casa Concha Carmenérè has a deep, rich garnet color. It has aromas of ripe plums and a bit of earthiness in aromas. Flavors range from its ripe plums to a bit of tobacco and some chocolate. This Carmenérè slips into a heat and sweet category. The sweetness of these wine flavors smooth the balance of the Garlic-Ancho Chili Paste (Sweet and heat). Silky smooth and velvet delivered, with a touch of smoke on the finish. As always, with Marques de Casa Concha, it’s a divine wine… If I had a house Carmenérè (I need a wine cellar to have “house wines,” so some day). Affordable, dependable, and delicious, this is it! 2016 Bervini Prosecco Millesimato Extra Dry ~ Italian Sparkling Wine. This is a sweet recipe, so I’m going with a dry wine to balance out the flavors, and it’s going to have Prosecco bubbles. (Who doesn’t love bubbles?) 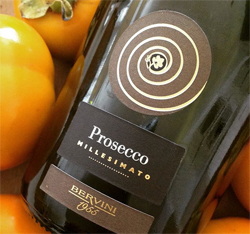 The 2016 Bervini Prosecco Millesimato Extra Dry is an adventure in delectableness. Tiny bubbles dance in the glass and right onto your palate. This one is recommended to pair well with sea food dishes, but we’re focused on fowl, not fish; and it’s my recommendation for all things turkey today. It has very lemony qualities, that paired so well with our roasted chicken dinner, smothered in our Stonewall Kitchen Boozy Bacon Barbecue Sauce (purchased), from the night that we opened this Prosecco to enjoy for another food and wine experience. I’ve held in my mind since then, because it was so memorable. What a great wine brand, with quality to trust and enjoy.